Myristica Oil Poisoning is the accidental or intentional intake (swallowing) of the compound. What is Myristica Oil Poisoning? What are the Causes of Myristica Oil Poisoning? What are the Signs and Symptoms of Myristica Oil Poisoning? The signs and symptoms of Myristica Oil Poisoning can vary from one individual to another. It may be mild in some and severe in others. Several systems of the body, such as the digestive system, nervous system, skin and ENT may be affected. How is First Aid administered for Myristica Oil Poisoning? Who should administer First Aid for Myristica Oil Poisoning? 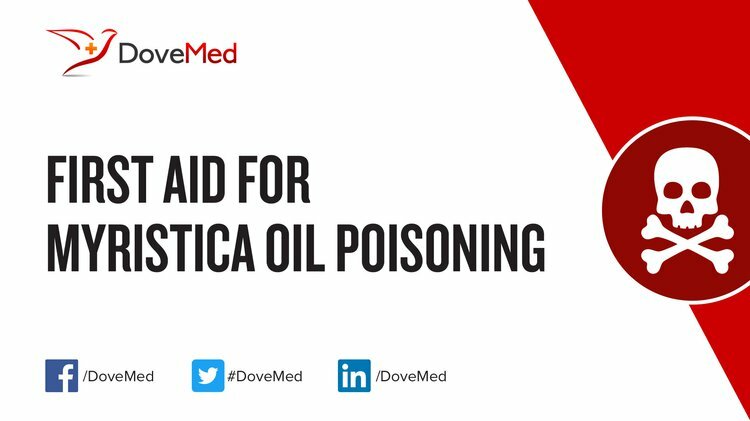 First aid for Myristica Oil Poisoning is administered by healthcare professionals. What is the Prognosis of Myristica Oil Poisoning? How can Myristica Oil Poisoning be Prevented? Raut, J. S., & Karuppayil, S. M. (2014). A status review on the medicinal properties of essential oils. Industrial Crops and Products, 62, 250-264. Suthisut, D., Fields, P. G., & Chandrapatya, A. (2011). Contact toxicity, feeding reduction, and repellency of essential oils from three plants from the Ginger Family (Zingiberaceae) and their major components against Sitophilus zeamais and Tribolium castaneum. Journal of economic entomology, 104(4), 1445-1454. Ehrenpreis, J. E., DesLauriers, C., Lank, P., Armstrong, P. K., & Leikin, J. B. (2014). Nutmeg poisonings: a retrospective review of 10 years experience from the Illinois Poison Center, 2001–2011. Journal of medical toxicology, 10(2), 148-151. Maya, K. M., Zachariah, T. J., & Krishnamoorthy, B. (2014). Chemical composition of essential oil of nutmeg (Myristicafragrans Houtt.) accesc sions. Journal of Spices and Aromatic Crops, 13(2). Lima, R. K., das Graças Cardoso, M., Andrade, M. A., Guimarães, P. L., Batista, L. R., & Nelson, D. L. (2012). Bactericidal and antioxidant activity of essential oils from Myristica fragrans Houtt and Salvia microphylla HBK. Journal of the American Oil Chemists' Society, 89(3), 523-528. Miguel, M. G. (2010). Antioxidant and anti-inflammatory activities of essential oils: a short review. Molecules, 15(12), 9252-9287. Vigan, M. (2010). Essential oils: renewal of interest and toxicity. European Journal of Dermatology, 20(6), 685-692.